Soldier USB Stick custom as a Branded Promotional Gift. 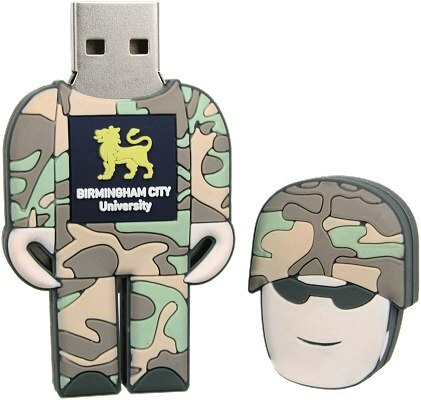 This usb drive character is a soldier in fatigues with a helmet and it is simply an example of the sort of USB character you can devise yourself. Choose you own colour scheme and your company logo can be part of the mould standing out in relief. All our character usb drives are actually Custom Shaped USB sticks so you will find them in that section too.